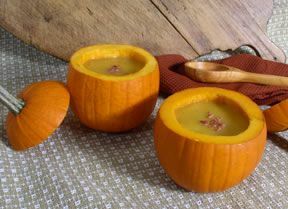 A hint of smokiness richly complements the sweet squash. Cut squash in half lengthwise, remove seeds and stringy pulp, peel and cut into cubes. Dice onion; peel, core and dice apple. Press or mince garlic. Chop sage finely, if using fresh; crumble, if using dry. In a heavy pot, 2 quarts or larger, melt butter. Add onion, sage and cardamom, if using. 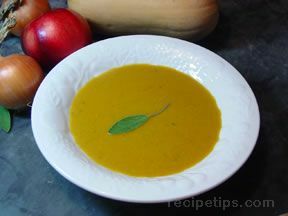 Cook and stir several minutes, then add garlic, apple and squash pieces. Stir to coat everything well with sage and butter. Add stock and cayenne pepper; cook until vegetables are soft. 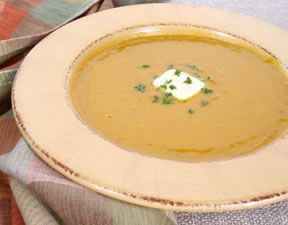 Puree soup (an immersion blender is ideal for this), stir in grated cheese and cream, and taste for seasoning. 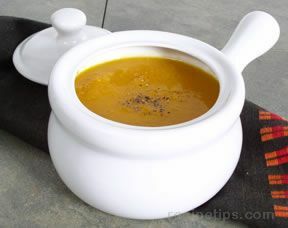 If soup is too thick, add more water or stock.